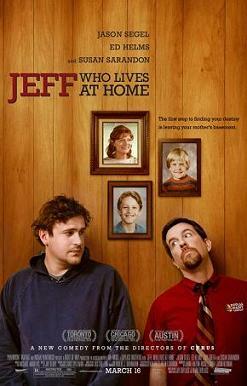 "Jeff, Who Lives at Home." The plot revolves around Jeff (Jason Segel). Thirty years old and living in his mother's basement. He's trying to figure out what his destiny is. He's waiting for signs. Meanwhile, his older brother (Ed Helms) tries to act, "like an adult," like he has his life together but is finding his relationship with his wife to be more than a bit rocky. Their mother (Susan Sarandon) is dealing with a secret admirer at work and wondering about how her own life has played out so far, thinking about some of her regrets and what she wished life would be like. How she got to this point where she hates her two grown children. I love the connections in this movie. Though it seems like everyone is dealing with different problems, it's all about expectations and how these characters get caught up in mundane details. For example: who is Kevin and why should Jeff be fixated on him? Jeff begins to wonder if maybe this sign that he's been waiting for if it will have nothing to do with himself. Maybe he's meant to help his brother out. This is a family that has a hard time trying to understand one another. The characters feel very real in that sense. The movie was touching. Parts of it were very funny, too. For example, when Jeff goes to get "high" with the kid he's been stalking. This was just an overall great movie. I highly recommend it. It's playing in select theaters, so you have to track it down, but it's well worth it.